Migration manager is the tool to keep your migrations organised and related clients updated. With Migration Manager addon you can store scenarios how to move accounts between two servers or two control panels, migrate customer account from competitors, move from one hardware model to newer one or upgrade control panel/server software. 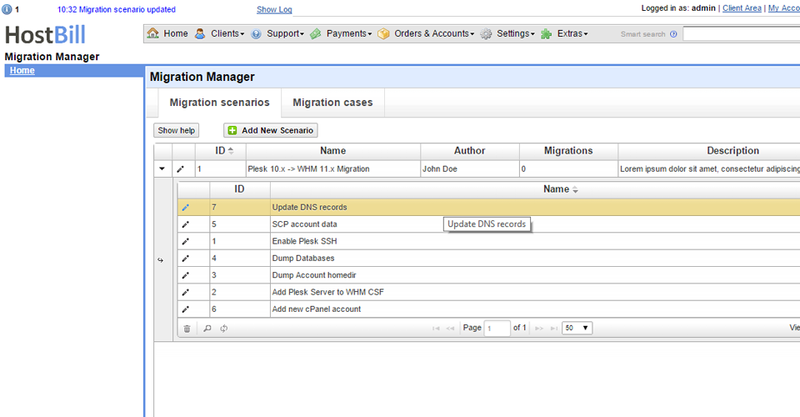 The module lets you create re-usable migration scenarios divided into different steps with attached files or notes. Related staff members are notified about migration they need to perform and related customer received auto-ticket notification when migration starts. Optionally you can also auto-notify customer on migration status updates using Support Tickets. The migrations can be scheduled to automatically open in the future. As migrations are likely to occur again, the how-to knowledge is kept in your Migration Manager tool.